There was little respite after the First World War, with fighting in the Third Afghan War in 1919 followed by numerous campaigns on the North-West Frontier, particularly in Waziristan. Four Nepalese Army Regiments also took pact in operations on the North-West Frontier during the Third Afghan War. Throughout the Great War the Amir Habibullah of Afghanistan had, by a mixture of guile and prevarication, resisted all attempts by the Germans and Turks to persuade him to declare war on Britain. However, after his murder in February 1919, he was succeeded by his son Amunulla who rapidly came under the influence of advisers many of whom, including his Commander-in-Chief, were strongly anti-British. In March and April 1919 there were outbreaks of serious disorder in India and, on the pretext that he wished to prevent similar disturbances spreading into Afghanistan, Amunulla ordered his army to concentrate on the frontier at the three historic entry points into India – the Khyber Pass, the Kurram Valley and the Khojak Pass into Baluchistan. Looking down over Bagh centre left. Tented camp bottom of valley. Close to assembly position for attack 11 May. Battle of Bagh on the 9th May, which was watched with keen interest by large numbers of tribesmen from the surrounding mountain tops, ended inconclusively and failed to dislodge the Afghans. 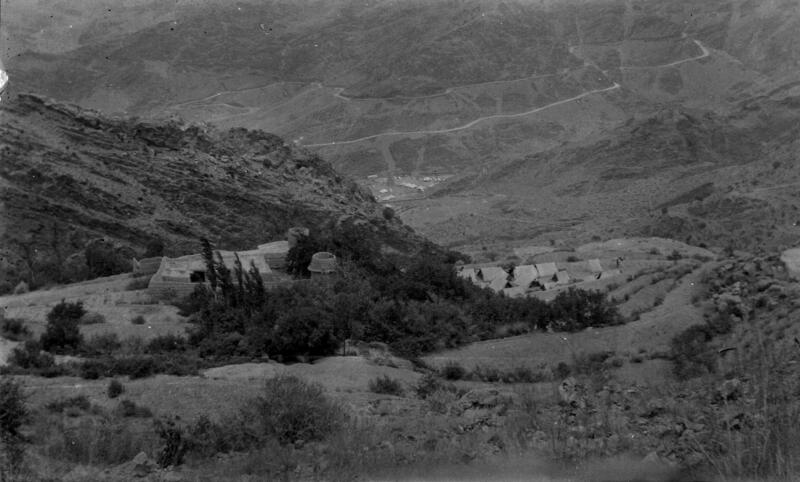 At the Second Battle of Bagh, on the 11th May, the 1st/11th and the 2nd/11th Gurkha Rifles, together with the 2nd Battalion The North Staffordshire Regiment, supported by artillery and machine guns, stormed the Afghan positions with kukri, bayonet and grenade, captured their guns and forced the Afghans to retreat. As they retreated they were bombed and machine-gunned by aircraft of the Royal Air Force. The British and Indian troops then advanced through the Pass to Dacca, some miles within Afghan territory, where a large fortified camp was established. After some further hard fighting around the camp against both Afghan regulars and tribesmen, in which 1st/9th Gurkha Rifles distinguished themselves, the Afghans sued for an armistice. 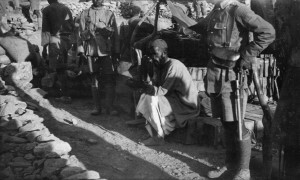 Men of 2nd 11GR guarding a Pathan prisoner. Note 1914 pattern leather accoutrements. On the 27th May 1919 General Nadir Khan, with a large force of Afghan regulars and tribesmen, including artillery carried on the backs of elephants, descended into the Kurram Valley and invested the Indian Garrison at Thal. The garrison, which included the 3rd/9th Gurkha Rifles, put up a spirited resistance but was soon running short of food, ammunition and water. What could have been a potentially critical situation was restored by the decisive action of General Dyer who quickly assembled a relief force and moved by road, rail and foot to raise the siege. On the 1st June he attacked the tribal contingents who lay between him and the town and quickly routed them. The next morning, having taken over command at Thal, he prepared to attack the main Afghan force which now totalled some 19,000 men and 13 guns. However, the Afghans, under orders from the Amir to suspend hostilities, hastily withdrew across the frontier before the attack could be launched, abandoning large quantities of stores which were promptly looted by their erstwhile allies the local tribesmen. General Wapshare, who commanded the British garrison at Quetta, decided to forestall any Afghan attempts to invade or to stir up trouble amongst the tribes in Baluchistan by launching an attack against the Afghan fort at Spin Baldak which lay some six miles inside the border. He assembled a force which consisted of two British, two Indian and two Gurkha battalions, together with some cavalry, artillery and a squadron of the Machine Gun Corps, and supported by some aircraft of the Royal Air Force, around the frontier railhead of Chaman. The two Gurkha battalions were the 1st/4th Gurkha Rifles and the 2nd/10th Gurkha Rifles. Before dawn on the 27th May, this force crossed the frontier and by dawn were in positions surrounding the fort. Supported by the artillery and machine-guns and by the Royal Air Force, the infantry stormed the fort using, for reputedly the last time in British history, scaling ladders. After some confused fighting, during which one of the Indian battalions was somewhat disconcerted when bombed in error by a British aircraft, the infantry finally surged over the defences and into the fort. Such defenders who had not already escaped fought on bravely until early afternoon when all resistance ceased. General Wapshare then withdrew his force to Chaman, leaving behind a small garrison who occupied the fort for a month, strengthened the defences, improved the water supply and then handed it back to the Afghans. After much mutual recrimination and protracted negotiations The Treaty of Rawalpindi was signed on the 8th August 1919. Thus ended the third and last of the wars between Afghanistan and British India.